Why Do I Need to Manage Terminology? Simply put, effective terminology management at the source saves businesses 20% or more on translation costs by boosting the efficiency of content authoring and translation, while increasing linguistic quality. Even if an author or translator has received specialized training in the target field, it still takes time to research important terminology during the content development and translation process. This is why it’s integral that they are provided with the right tools that enable them to look up approved translations quickly and dynamically, thereby allowing them to focus on doing what they do best: technical writing or translating. Powered by users from around the world, TermWiki.com is the world’s largest terminology website. Search your terms and translations in 100+ languages. Studies find that the number one factor affecting content and translation quality is the inaccurate and inconsistent use of technical terms specific to a particular industry and subject matter. Inaccurate or inconsistent terms not only cause confusion among readers, but can lead to poor product quality or usability. Furthermore, time spent revising terminology errors results in launch delays, or worse — potentially millions of dollars in damages from product recalls or fines. In the case of life sciences and other regulated industries, terminology errors can also lead to customer safety issues and regulatory compliance risks. 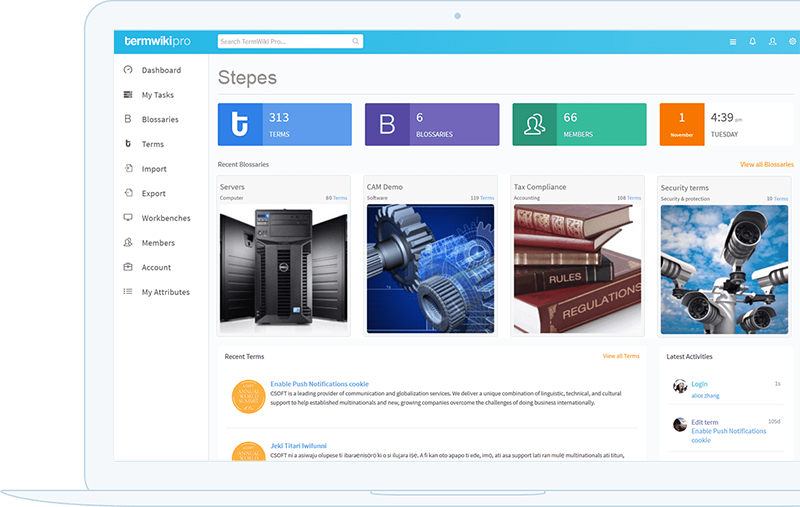 TermWiki, the industry’s first terminology as a service (TaaS) system, revitalizes the traditional, off-the-shelf approach to terminology management by allowing organizations to efficiently develop, manage and translate terminology in an online collaborative environment without third-party software installation. Proactive terminology management involves the creation and maintenance of a multilingual database covering all the terminology used for a company’s products and marketing materials. Because technical terms can typically be very specific and accuracy is of utmost importance, an ad hoc approach to terminology management is simply inefficient to achieve content quality. From specifications and drawings to technical documentation, regulatory documents, and marketing collateral, all different forms of business communication are typically products of multiple authors in different locations. Because of this, terminology management is the most efficient solution for ensuring that your business consistently speaks with one voice. Securing terminological harmony across translated documents not only improves the usability of your products, it also enables you to better adapt them to global markets and establish a uniform corporate identity. More advanced terminology management involves further defining and classifying the terms, so that they can be applied to specific product localization and projects. Beyond the easy to use Excel tabular glossary list, there are many third party tools that help collect, define, classify, and lookup terminology. These tools allow a translator to efficiently lookup and manage terms during translation by providing automatic lookup for terminology translation and a streamlined process for verifying terminology translation and consistency. Good terminology management tools also enable technical authors and translators to incorporate additional information, such as definitions, context, gender, source, synonyms, and product dependency, and so forth. Some tools also allow terms to be extracted based on certain sets of criteria such as occurrence, frequency, and origin. Together with terminology extraction (Term Extract), terminology management (TermWiki Pro), terminology lookup (Term Assist), businesses publish their multilingual terminology and glossaries over the Internet with the TermWiki Widget, so that customers, employees, and suppliers around the world can readily look up the information on demand. These online glossaries ensure quality and that consistent expressions and terms are used for multinational marketing, branding, and regulatory compliance. Terminology management enables organizations of any size to use the same terms consistently within and across the communication types that accompany a product or service. Typical communication types include specifications, drawings, user interface, human factors data, software strings, help systems, technical documentation, marketing materials, documents for regulatory submission, and so on. As multiple authors typically contribute to these communications, terminology management is the most efficient solution for ensuring that the organization speaks with one voice. Having a comprehensive, project-specific termbase available at the outset of a project frees developers, writers – and ultimately, translators – from the tedious task of researching terms on their own and reduces the danger of multiple communicators accidentally coining multiple terms for the same feature, which either goes undetected and causes confusion for the user, or causes unnecessary expense and delays for terminology harmonization throughout the product lifecycle. The life sciences being a regulated industry, organizations operating in this field are subject to government oversight. This means, for instance, that a wide variety of documents such as clinical trial reports, user manuals, and product labeling have to be submitted to regulatory bodies for review. One important aspect of the formal quality of these submissions is the consistent use of correct terminology within any given document and across all documents in a submission package. Typically, many different, geographically distributed authors contribute to these submissions, and considering the endless opportunities for introducing synonyms and variants into these documents, terminology management is a mandatory part of any well-planned submission process. In the absence of controlled terminology and/or a system to ensure the consistent use of terminology across documents, and, in particular, between the product itself and the instructions for the use of a product, it is to be expected that terminological inconsistencies result in completely avoidable support costs. In an environment where content is typically created in a team; for example, technical authors write instructions and graphic artists create the visuals that illustrate these instructions, and neither the author nor the graphic artist may see his or her work in the context of the other contributors’ work, inconsistencies are almost inevitable. If a situation arises where a term used in an illustration does not match the terms used in the corresponding text, the user will in all likelihood be confused – and either make an unnecessary support call or, even worse, return the product for a refund. A term designates a feature or function, an item or component. In the case of a physical item, if an organization uses more than one term for the same item, it is highly probable that multiple stock keeping units (SKUs) are assigned to one and the same article. This situation not only causes unnecessary inventory carrying costs but also may prevent buyers from realizing volume discounts that they would otherwise have qualified for. Identifying which key terms are most closely associated with the product you intend to localize. Mining legacy terms from previous versions of the product (and its related documentation) to ensure the maximum amount of content leverage. Defining each term, and specifying a distinct set of terminological attributes (including part of speech, source context, usage status, etc.) that are most pertinent to your organization’s localization workflow. Collecting these core terms in a centralized, accessible environment (such as a terminology management system or software application). Translating each term into your organization’s core set of target languages, ensuring that your corporate terminology is consistent both across documents and across all languages. Dispersing multilingual glossaries to all functional groups that are involved in your product’s international development cycle. CSOFT services a number of Fortune 500 companies around the globe, for whom we manage terminological data in more than 100 different languages. We can help you organize and execute the management of your multilingual corporate glossary, too. By proactively managing consistency issues at a very early stage, we are able to prevent minor discrepancies from becoming serious problems later on in the localization cycle, when correction inevitably requires more time, effort, and money. Terminology translation quality in health care and the life sciences industry can have a direct impact on patients’ safety. The following is an example from the book “Found in Translation”, illustrating how the mistranslation of a term resulted in a hospital’s $71 million dollar loss. Despite the apparent importance of terminology management, many Life Sciences companies either lack a mature process that allows them to systematically manage product terminology or don’t manage their terminology at all. Indeed, many companies would fail an FDA audit today should they be audited on how terminology is created, reviewed, translated, and approved. Some of CSOFT’s clients require that some of their projects not only meet high quality standards, but that these translations also are delivered within a very short timeframe. To achieve turnaround times of 48 hours for these critical translation projects, we have developed a sophisticated workflow in which terminology management plays a pivotal role. To avoid any delays relating to terminology such as wrong terms being used by a translator or simple differences of opinion between the translation professional and reviewer regarding terminology, we extract key terms from the source document immediately upon receipt of files from the client, and have these key terms translated while the linguist is already working on the translation of this urgent project. The bilingual glossary is then reviewed by the reviewer, who makes changes to the glossary if needed. Once reviewed, the approved glossary is returned to the linguist who updates the translation with any changes the reviewer made prior to submitting the translation for review. This process ensures that all key terms are translated correctly; avoiding any delays that might otherwise occur as the result of terminology changes the reviewer would require the translator to make before the translation could be approved.